Lots of ‘firsts’ in our first full year of dancing. July also saw our memorable trip to Sidmouth Folk Festival staying in Captain Rodney’s house. We learnt so much that week from workshops, mixing with other sides and soaking up the atmosphere. First meeting with Derby Morris Men on the promenade at Sidmouth. Also appeared ‘by accident’ on the main stage (after taking part in the procession) dancing massed ‘Jockey to the Fair’ followed by ‘Bonny Green’. September: At the invitation of local farmer, Frank Marchington, we danced on his barren ‘Paradise’ field to ‘help with fertility’. 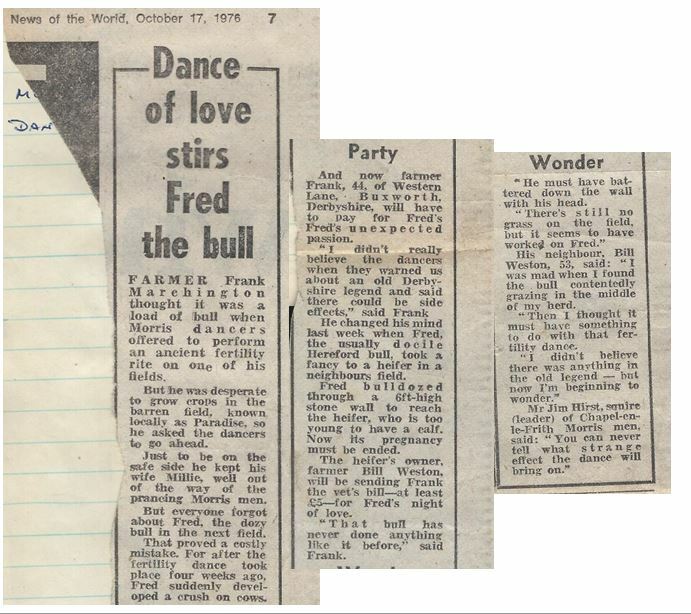 A few weeks later Frank’s normally docile bull, Fred, leapt over a wall and savaged a young heifer. This story was picked up by News of the World.